Faced with a space crunch, Irish cold storage provider Molloy & Sherry moved to narrow-aisle storage and Aisle-Master articulated forklifts, with cool results. When it comes to cold storage, every inch is precious real estate. Unlike dry storage facilities, contract warehousing companies that handle frozen and refrigerated goods have to factor in the enormous cost of maintaining chilly temperatures in vast spaces. The more products they can squeeze in, the better. One such company is Molloy & Sherry, a third-party warehouse specialist in Ireland that provides cold storage and transportation services for food-industry customers. The company operates three facilities in the Dublin area, including a 200,000-square-foot warehouse in the town of Swords. The operations include 11,000 cold storage pallet positions, 3,000 refrigerated positions, and 500 dry positions. A few years back, the company launched an effort to maximize storage space within a key 50,000-square-foot frozen area, where it stores products like chicken, butter, and frozen bread for customers. To boost storage density, managers chose narrow-aisle racking for this freezer space, where temperatures bottom out at minus 22 degrees Celsius (minus 8 degrees Fahrenheit). The move to narrow-aisle racking resulted in an immediate increase in storage slots. "We gained over 500 storage positions with the narrow aisles," reports Patrick Boyd, facilities manager. He says that this allowed the addition of one full aisle in that portion of the building. The Aisle-Master articulated forklift is suited for use in narrow spaces. The front portion of the vehicle, including the forks, pivot left and right independently of the rest of the truck. 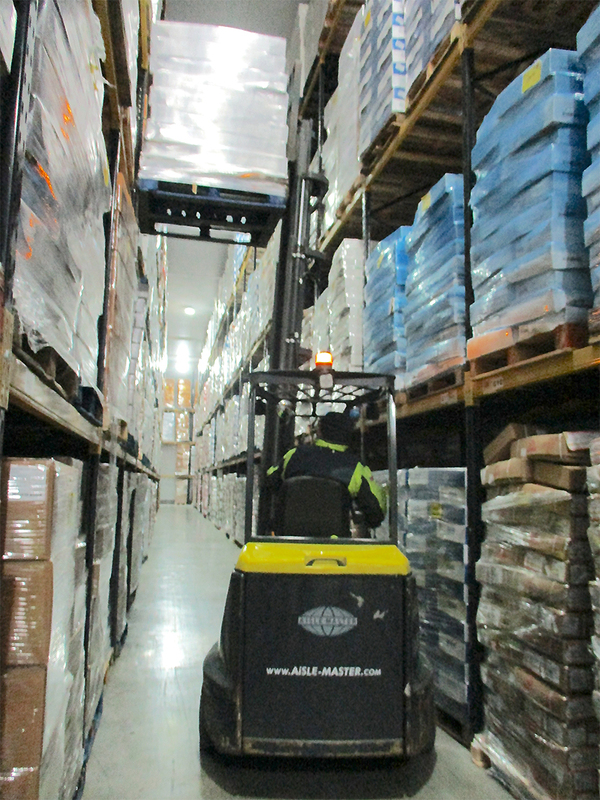 The move to narrow-aisle racking also had implications for the forklifts that would be used in the freezer area. The narrow aisles measure only 2.1 meters wide (6.9 feet), compared with widths of at least three meters (9.8 feet) in the conventional rack areas. And because the pallets hang over the rack edges by several inches on each side, the actual navigable space between the racks is even narrower. That meant Molloy & Sherry needed forklifts capable of working in aisles that were only about six feet wide. After weighing its options, the company chose the Aisle-Master articulated forklift, which is manufactured by Ireland-based Combilift. The Aisle-Master's design makes it well suited for use in narrow spaces. The truck's forks rest upon an articulated swivel and a separate set of wheels, which allows the front portion of the vehicle, including the forks, to easily pivot left and right independently of the rest of the truck. The Aisle-Master truck drives into an aisle the same way a conventional reach truck does and then swivels its forks to face rack positions at the optimal angle for putaway and retrieval. Setting the forks at an angle also provides better visibility for drivers, resulting in safer handling. The trucks used in Molloy & Sherry's operation are designed to provide safe, stable lifting of loads weighing 1,250 kilograms (2,756 pounds) to a height of 8.4 meters (27.6 feet). The Aisle-Master also comes in models that can operate in aisles as narrow as 1.6 meters (5.2 feet) and can lift loads up to 15 meters high (49.2 feet). Boyd says that his forklift operators were initially reluctant to drive a truck that was so radically different from what they were used to. But they soon discovered that putaway and retrieval tasks went faster with the Aisle-Master articulated trucks than with conventional forklifts. "Once they got on them, they realized it was easier to maneuver the pallets," he says. "We were delighted to hear that from our drivers, who now say they would not want to go back to their old trucks." On top of that, the trucks have proved to be highly dependable. Boyd reports that Molloy & Sherry has been using Aisle-Master trucks since 2013 and has not had to do any repairs beyond normal maintenance. All in all, the decision to go with the Combilift trucks "was a no-brainer," according to Boyd. "We covered the cost in nearly the first year [with space savings]," he says. "The Aisle-Masters are very, very reliable and dependable. They allow us to keep these lads working." Feedback: What did you think of this article? We'd like to hear from you. DC VELOCITY is committed to accuracy and clarity in the delivery of important and useful logistics and supply chain news and information. If you find anything in DC VELOCITY you feel is inaccurate or warrants further explanation, please ?Subject=Feedback - : A well-articulated solution">contact Chief Editor David Maloney. All comments are eligible for publication in the letters section of DC VELOCITY magazine. Please include you name and the name of the company or organization your work for.